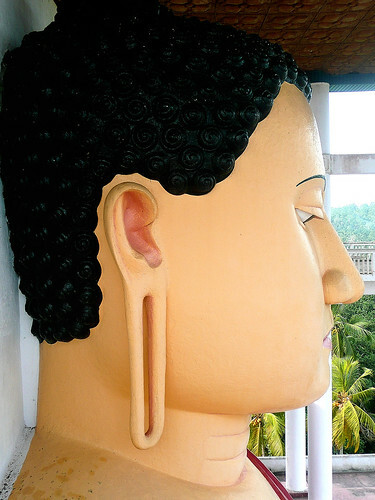 Weherahena Temple in the little southern Sri Lankan town of Matara is a small but interesting temple that has many wall murals/cartoons depicting interpretations of events in the life of Buddha. The temple is multi-story with awesome views from the top and amazing devotional ceremonies in the basement. It is worth the short detour out of Matara. 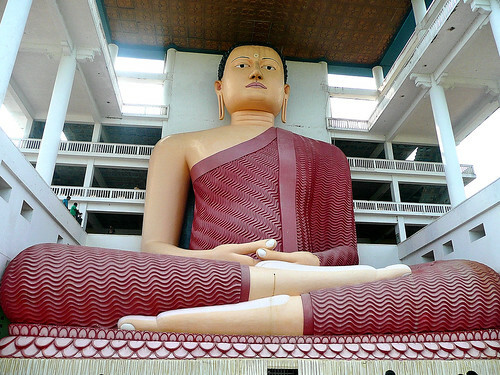 Sri Lanka is a multi-religious country with Theravada Buddhism being the majority religion in the country. As per Patrick Peebles in "The History of Sri Lanka", the major legacy left to the world by the ancient Anuradhapura Kingdom was the "preservation of the teaching of the Buddha according to the Theravada ("way of the elders") and is a focus of Sinhalese National Pride." 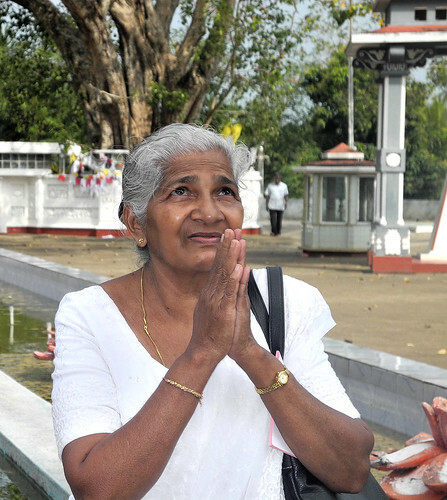 Since it is such a prevalent religion in Sri Lanka, there are many temples. 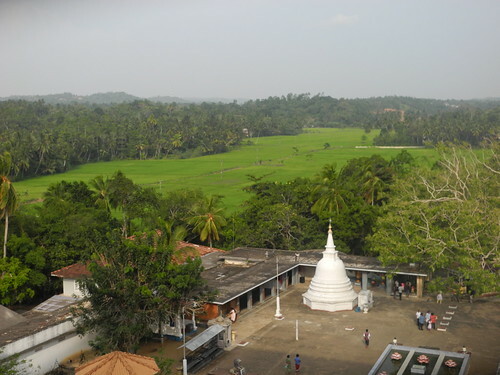 Many of these temples however are similar, but cartoon covered walls and the massive Buddha statue make the Weherahena Temple in Matara slightly more unique. The short video below is walk through of different aspects of the temple (starting at the front gate). You will also see the cartoon pictures on the wall, the giant Buddha in the picture above, some of the views from the top of the temple and also some of the worshipers. There was also a ceremony in the basement of the temple that we recorded and we cut back to fairly often. Hope you enjoy. 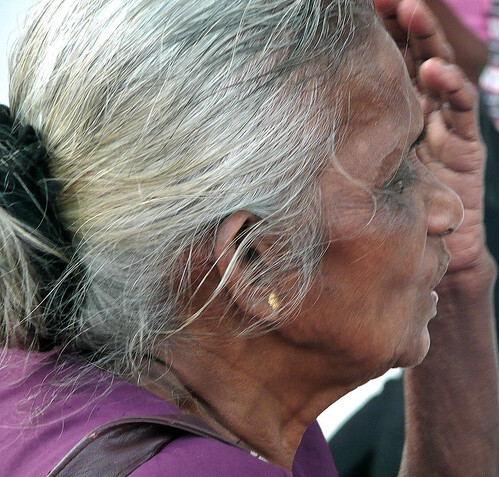 We visited the temple on the Sri Lanka National Independence day and there were many people doing their devotions: both young and old. The three pictures below show two of the older ladies we saw there and also a group of kids who were at the temple paying their respects with their families. Of course, this being a typical Buddhist temple, there are many statues in and around the temple. 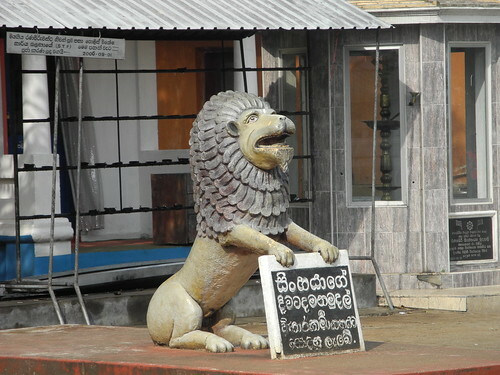 The most notable statue was the one of the big Buddha (see the top) but there were others scattered in the courtyard like the Lion in the picture below. The temple is a multi-story building and it is possible to walk through the temple and up the stairs to enjoy the tremendous view of the surrounding rice fields and forests. 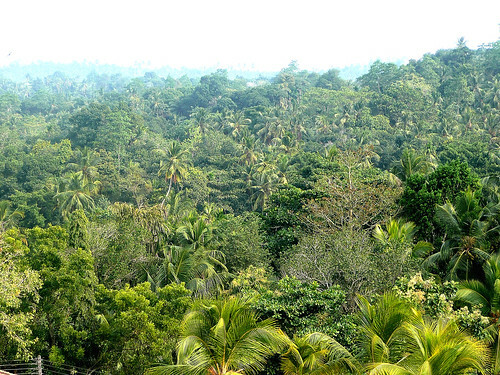 The view of the greenery was spectacular and definitely tropical. If you visit the temple it is definitely worth climbing to the top. On a final note, we visited the temple after a fairly dramatic morning in Matara (will cover this more in a later post). After getting off the bus from Tangelle I realized I left my day pack (with all the electronic gear including cameras and video camera) on the bus. I spent an hour chasing different buses until I eventually found the right bus and recovered the back with everything in it. So visiting the temple was a really relaxing thing to do. Hope you enjoyed the post. wow, that is quite a story about losing your pack but recovering it! very nice report on the temple. that Buddha's head is the size of my living room! i liked the video as it made me feel like i was there too. the audio was especially clear. nice work! Hi MJ - yes the bag story was something else and will be the next blog - lol - my wife said that when I started chasing the bus I was like Indiana Jones - she dubbed me Indiana Paul - ha ha. Thanks for the kind words on the blog and video. Yes the statue was big and it was a really surreal kind of Temple. The audio was just recorded on the camcorder so gald it came out. Once again, thanks for your kind comments.